Fire extinguishers—unless they are your livelihood like they are for us—are pretty easy to forget about. They sit in your workplace or home day after day "just in case," but of course you hope you'll never have to use one. Even though fire extinguishers may not always be top of mind, there's nothing worse than needing an extinguisher in an emergency only to discover that it isn't charged and doesn't work. Portable fire extinguisher inspection is extremely important for the protection of businesses and homes—especially since OSHA and Fire Codes require specific procedures when it comes to fire extinguishers in the workplace. Read on to discover the best fire extinguisher testing schedule for optimal safety and compliance. Depending on the type of inspection being performed, there are different recommendations and requirements for the time between inspections. Here are three ways fire extinguishers need to be tested, and the schedule for each. Watch the video on exactly how to perform your own monthly fire extinguisher inspection. What should you look for during a visual inspection? Look for obvious signs of physical damage, such as corrosion, leakage, or dents. Check the pressure gauge to make sure the indicator is in the operating range. 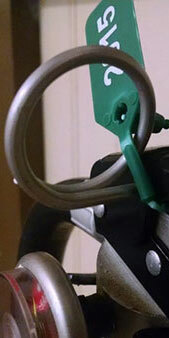 Make sure the pull-pin is not missing and the pull pin seal is intact. Verify the date of the last professional inspection. Date and initial the back of the tag to log the monthly visual inspection. Employers need to perform a full maintenance check on their workplace's portable fire extinguishers once per year, according to OSHA 29 CFR 1910.157(e)(3). "Maintenance" means a thorough examination and repair, as needed, of all your facility's portable fire extinguishers, as covered in NFPA 10(98), Sec. 4-4. Annual fire extinguisher maintenance inspections should be performed by a professional fire protection company. These companies have the proper tools and training to ensure optimal compliance while recognizing and correcting any potentially hazardous situations. 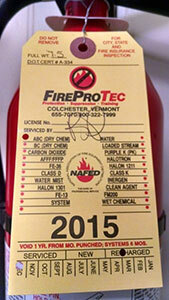 Once a fire extinguisher passes its annual maintenance, it is verified with a dated inspection tag. That tag is good for one year from the date indicated. If the unit fails to pass the inspection, it must be repaired or replaced. This internal maintenance also requires the services of a fire protection company. Internal maintenance testing involves discharging of the fire extinguisher and a complete internal examination and recharging to insure all components of the fire extinguisher are working correctly. Extinguishers such as the dry chemical type requiring a 12 year hydrostatic test also require a 6 year internal examination. In addition to or as part of the internal maintenance examination, periodically the fire extinguisher cylinders must be hydrostatically tested to ensure their integrity and ability to safety contain the pressure used to expel the agent. Typically, pressurized water, carbon dioxide, and wet chemical extinguishers need to be hydrostatically tested every 5 years. 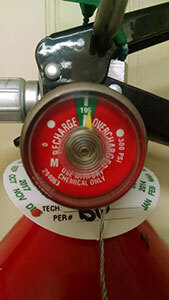 Dry chemical extinguishers need to be tested every 12 years. A complete chart of test intervals for various types of equipment can be found here. Proper testing and maintenance of your workplace's portable fire extinguishers does more than fulfill some OSHA and NFPA requirements—it ensures the safety of your employees and your business. 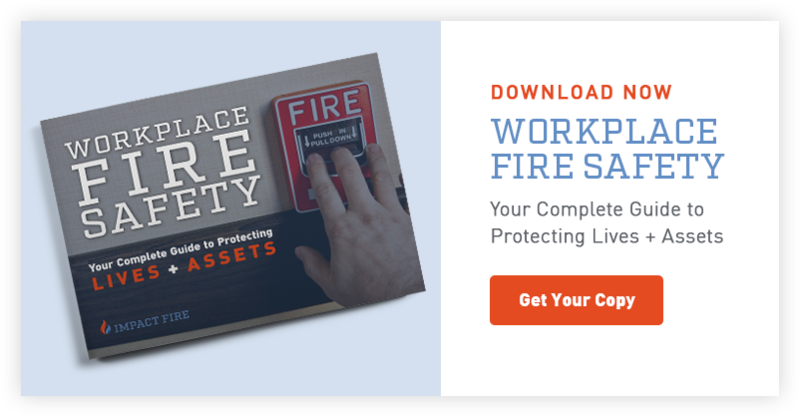 Is your business fully protected from all potential fire hazards? Schedule a hazard assessment today and get started toward creating a safer workplace.